Beyond the lush landscaping, behind the elegant neoclassical-inspired facade, you'll find a thoroughly modern hotel catering to the needs of the business traveller. 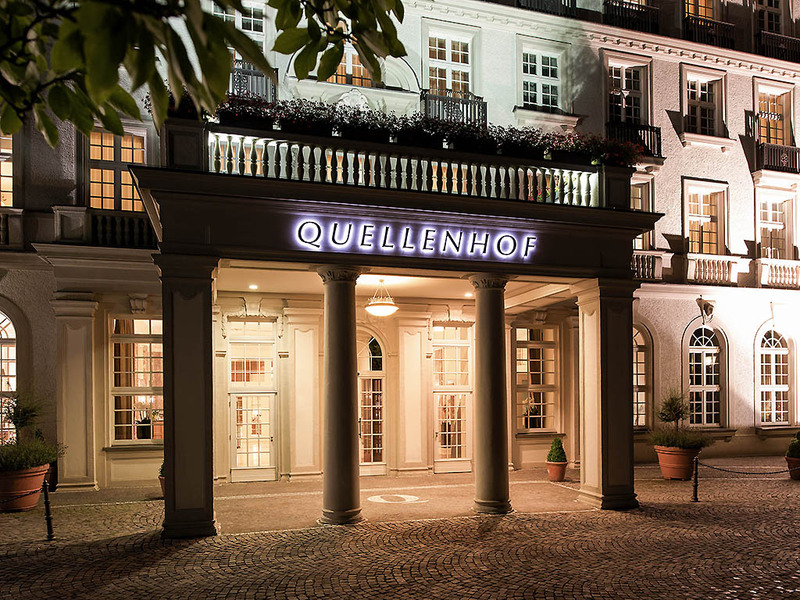 Within easy reach of the Netherlands and Belgium and adjacent to the Eurogress conventionc entre, the Pullman Aachen Quellenhof is a top pick for meetings and conferences. Approximately 16,100 sq. ft. (1500 m²) is available for your events. 181 rooms with unique features such as Jim Thompson seat covers and curtains made from Thai silk. Beds with sprung mattresses from Sleepeezee, suppliers to the British royal family. 6 room categories, 24-hour room service and Internet access. The classic style restaurant "La Brasserie" with adjoining terrace serves regional and seasonal offers. We are open daily from 12:15 to 2:30 pm and from 6:30 to 10:30 pm. Designed in colonial style, our air-conditioned Elephant Bar serves excellent snacks and finger food. Why not visit us between 5pm and midnight and enjoy your favorite drink in pleasant surroundings?